Agile work, the new approach to work, is placing new expectations on the workplace. One of my first bosses used to regularly ask his team members whether they would get their job again if they had to reapply for it? In another rendition of the question, he would ask whether we would get our jobs again if we had to be elected to them? A question he never asked was whether we’d actually want them (more on that later). It’s a rare role that hasn’t changed in the last five years, and all of us are pedaling to keep up and sustain our success within the context of new requirements, heightened demands and shifting expectations. One of the drivers of this change is the push by many companies for agility. Agile and Agile-inspired ways of working are all about speed, innovation and customer focus. Agile software development is defined by the Agile Manifesto and uses specific frameworks such as scrums and sprints. In addition, teams outside of information technology (IT) are experimenting and implementing Agile-oriented work principles such as standups or retros. While agile can also be defined as mobile working or a general culture of adaptability and responsiveness, true Agile work – that inspired by software development processes – is the hot new approach to work that is placing new expectations on workplace. In addition, these new ways of working require new skill sets to respond effectively. But, what must we do differently? A brilliant leader used to say ‘design begins when people move in’, and this is never more true than in an Agile environment. The work experiences that foster an Agile environment are those in which people have plenty of control over their space. They can move desks to facilitate paired programming or shift their work surfaces in response to changes in the project cycle that require different configurations. This can be a challenge, however, for real estate and facilities teams whose success has been built on standards, consistency, and the need to manage all the complexities of the workplace. Giving up control and empowering others can be challenging, but worth it in terms of the results produced. Agility can also require new systems in everything from budgeting to inventory management, and from sourcing to user education approaches. A budget that supports ongoing incremental investments in space, rather than less frequent infusions is an example, as well as an inventory management system that allows for kits of parts to be easily deployed and leveraged for the ebb and flow of projects and teams. Agile is a business change that will not be supported with new mindsets alone, system-level changes will be necessary, and this requires new skill sets to initiate, implement, and manage. Success with Agile also requires real estate (RE), facilities management (FM) and design expertise to be embedded in the business and ‘at the table’ in a deeper way than ever before. To be proactive, to bring new ideas, and to respond immediately to internal customer needs requires a high level of proximity with each other and intimacy with each other’s processes. A customer told us a great story recently: A leader of an Agile IT team was meeting with a leader of RE/FM/design and the leader of RE/FM/design said, ‘Yes, I know we need to move from a model of changing the workplace every five years to more like every year.” The Agile IT leader smiled and said, “Try every two weeks.” The need for the workplace to respond, change, and adapt is unprecedented and it is critical to teams’ success – not just IT teams, but any team seeking to respond quickly and innovatively – shifting work processes based on changing customer needs. Agile success is also dependent on a team’s relationships, interactions and common goals. One person’s work isn’t done until the whole team’s work is complete. Real estate, facilities, and design must focus on team spaces, design for teams and solve for teams. Even moves, adds and changes must consider whole teams, rather than just individuals. 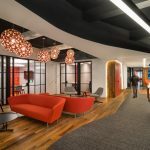 This lens requires solutions like front porches to welcome customers with touchdown space for connecting and understanding customer needs. Or backyard-type spaces where teams can come together privately in casual space that invites planned and unplanned connections. 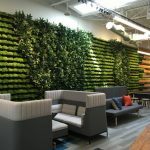 It requires fixed, fluid, and flexible spaces that provide for a full ecosystem of choices for teams as a whole as well as team members individually. In our new world of Agile, we need a significant level of comfort with data, measurement, and quantified environments. Even more though, we need to turn the measurement into the message and translate what we know into stories that communicate needs and results in a compelling way. We need to be great story-builders and storytellers to inspire the changes we believe need to take place in our workplaces. One Agile leader I was speaking with recently said her planning time is now double what her working time is, and she’s getting twice as much done. We’re used to taking action and we’re guilty of not always taking the time we need to plan, but Agile requires a high degree of planning. It also requires a disciplined approach to work. We need to do one thing at a time and expect the same of others. This is antithetical to current habits of multi-tasking, but increases velocity overall. Limiting the number of projects and tasks we focus on makes us more effective, faster, more innovative, and more customer focused – in a word, more Agile. Overall, there’s also a new mindset that must come with Agile, and this is what my early boss was trying to communicate. Success with Agile is not just about ‘doing Agile’, but about ‘being Agile’. This means taking on a new way of thinking and a new way of learning – now and ongoing. “It is what you learn after you know it all that counts,” said legendary college basketball coach John Wooden. Success with Agile requires curiosity and a drive for ongoing learning. Would we get our jobs again if we applied today? Would we be elected to them? Would we want to be? What is it, anyway, that keeps so many of us waking up every morning passionate about contributing in this world of the workplace? Perhaps it’s because we make a difference – shaping the experience of so many people for so many hours of their day. We are leaders with broad spheres of influence, and we have a significant opportunity to serve with new approaches and lead the way toward not only speed, innovation, and customer focus, but also toward creating great experiences for people. What is Digital Transformation and What Does it Mean for Workplace Design? Agreed! It’s incumbent on us grab onto the changes and equip ourselves for them, isn’t it?